Anyone who survives a deadly disaster will never be the same again. Some people remain emotionally traumatized for life by Post Traumatic Stress Disorder (PTSD). Most people, with effort, find ways to overcome the distressing effects of their emotional trauma. A few even discover positive effects from what they went through. Often neglected, however, are the families and loved ones of survivors. They also have their own lasting emotional trauma to deal with. Many show signs of what might be called "By-stander PTSD." The disaster that almost killed their loved one also changes their lives. On December 28th, 1998, the survivors of a plane that crashed in Portland, Oregon, in 1978 held a 20th anniversary reunion. It was organized by Aimee Conner, one of the survivors. Aimee had been 17 years old at the time. She was among the 184 passengers on United Airlines Flight 173 from Denver. As the plane approached Portland the right landing gear thumped down. A locking pin had broken. The pilots circled the airport as they attempted to determine if the right landing gear would collapse when the plane landed. With all attention devoted to the landing gear problem, Captain Malburn McBroom did not notice that he was running out of fuel. When his engines lost power he could not get back to the airport for a crash landing. By now it was dark out. The best he could do was to bring the plane down in an area away from main streets and residences. Despite both wings getting sheared off by tall fir trees, the main cabin came down without major damage. Ten were killed, 174 survived. No one on the ground was killed. In the years that followed the crash Aimee found that it became more and more difficult to fly. She says she had to take Valium and consume many drinks before she could make herself get on a plane. "Finally," she says, "I decided it wasn't worth it." She went into counseling for PTSD. She says "For years I'd been trying to act 'normal.' 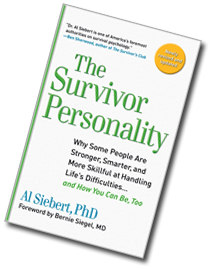 I finally realized I am a perfectly normal person and this is what a normal person feels after surviving an airplane crash." Aimee, now a hospice nurse, knew that every December brought back vivid memories. She began wondering how the crash of United Flight 173 was affecting other survivors. She told newspaper columnist Margie Boule about her desire to hold a reunion. Boule's column drew many responses and the publicity led to a large turnout for a potluck dinner at a local church on December 28th. Aimee invited me to attend along with Mike Maxwell a Vietnam veteran with many years experience as a PTSD counselor. During dinner Mike and I asked survivors how the crash had affected their lives. They said it made them appreciate life more, realize how temporary life can be, and made them appreciate their loved ones more deeply. One man said he had been in his 20's and living as though he was invulnerable. The crash made him more conscious of safety for himself and now for his family. Most of the survivors were accompanied by family members. During the evening I heard over and over how the families and loved ones have not been asked about their feelings and how the crash effected their lives. A woman whose husband was on Flight 173 told me how she and the others waiting at the airport were herded into a room by airline officials and only slowly given bits of information. She said that people watching TV had better, more complete information than they were given. She said that after the crash, various interviewers and the airline officials only talked with her husband. No one ever interviewed her about what she went through. Mike and I asked her to tell us her story. She was eager to do so. I was bothered to see that a few survivors still had strong symptoms of PTSD. The pilot of the plane, Capt. McBroom, was brought to the reunion by his family. He looked like a broken man. He had been found negligent by a board of inquiry for letting his plane run out of fuel. He lost his pilot's license. His daughter told me he stills feels deep remorse over the ten deaths. Even though the survivors gave him a standing ovation in appreciation for his skill in bringing the plane down with such little loss of life, he still seemed deeply wounded. His youngest daughter told me afterward that he withdrew from the family after the crash and has never had a close relationship with her. Several of the survivors smelled strongly of alcohol. One survivor, a woman whose husband and two sons were also on flight 173, said she won't let all of them fly anywhere on the same plane. She said that she still cannot make herself fly into Portland from the East, even by taking extra Valium. If she must fly she will always route herself through California or Seattle. A number of family members said that the survivor never talked about the crash. They wanted to inquire, but didn't know how to ask. Fortunately, Mike brought a handout about the symptoms of PTSD that included my guidelines on how to listen to survivors of extreme experiences. Many people asked for it. The reunion was a powerful healing experience for those who attended Now they will have different, more positive memories to associate with December 28. My experience with this group of survivors and their families, 20 years after the crash, emphasizes that PTSD does not go away by itself and cannot be suppressed by drugs or alcohol. The only way to recover is to talk with understanding listeners, write about the experience, and keep retelling the story until one gains control over the memories. If you know of anyone who might benefit from guidelines on how to recover from PTSD and even be transformed by their experience, I will soon place a file titled "Telling Your Survivor Story" at my web site. It will be near the "Guidelines for Listening to Survivors."